Go to original pattern for design DROPS 10-16. 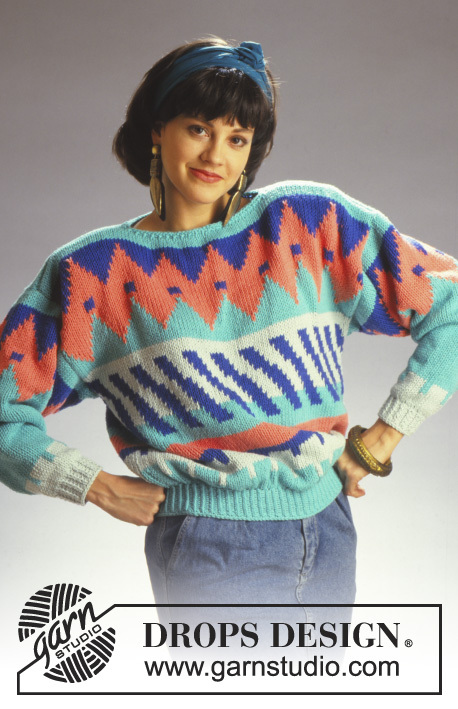 DROPS jumper with pattern borders in “Paris”. 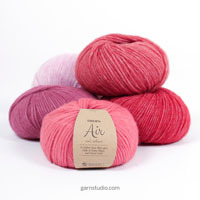 Size S – L.
DROPS circular and double pointed needles size 2.5 and 5 mm/US 1or 2 and 8, or size needed to get 17 sts x 23 rows in stockinette st on needle size 5 mm / US 8 = 4'' x 4'' (10 x 10 cm). Pattern: See diagram. The diagram is seen from the RS and the entire pattern is worked in stockinette st.
Pattern body piece: 4 cm / 1½'' sea green, M.1, 3-4 cm/1"-1½" light blue green, M.2, 3-4 cm/1"-1½" blue, 6-7 cm/2 1/4"-2 3/4 salmon, 2 cm / 3/4'' sea green, M.3, M.4. Pattern sleeve: 3 cm / 1'' light blue green, M.2 but work sea green instead of blue, continue in sea green until piece measures 32-39 cm, M.4. Body: The body piece is worked in the round on circular needle up to armhole and then completed back and forth on needle. 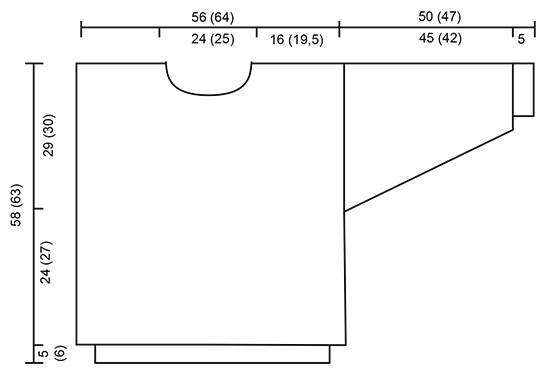 Alternatively continue in the round and cut for armhole after wards – see instructions in pattern. Cast on 132-144 sts on circular needle size 2.5 mm / US 1.5 with sea green and work 5-6 cm / 2''-2 3/8'' rib. 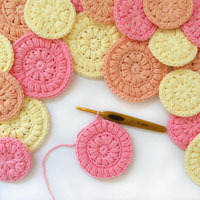 Change to circular needle size 5 mm / US 8 and continue in pattern, at the same time inc 60-72 sts evenly on first round = 192-216 sts. REMEMBER THE GAUGE! When piece measures 29-33 cm divide the piece in 2 and complete front and back pieces separately, back and forth on needle. If cutting for armhole cast on 5 sts each side (to be cut afterwards and not included in pattern) and continue in the round. 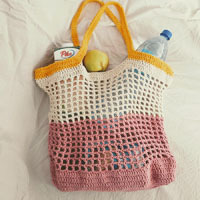 Front piece: = 96-108 sts. After the last pattern row work 4 cm / 1½'' sea green, at the same time on second row bind off the middle 36-38 sts for neck and complete each side separately. Bind off 2 sts on neckline on next row and bind off remaining sts on shoulder when piece measures 58-63 cm. Back piece: = 108-114-120 sts. Like front piece, but bind off for neck on the 4th row in sea green. If cutting for armhole: Continue in the round. Bind off for neck as described above and complete piece back and forth on needle. Bind off remaining sts on shoulder when piece measures 58-63 cm. 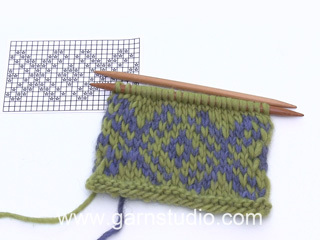 Sleeve: Cast on 30-32 sts on double pointed needles size 2.5 mm / US 1.5 with light blue green and work 5 cm / 2'' rib. Change to double pointed needles size 5 mm / US 8 and continue in pattern, at the same time inc 24-24 sts evenly on first round = 54-56 sts. Inc 2 sts mid under arm a total of 23-23 times on every 4th round = 100-102 sts. After the last pattern row work 3 cm / 1'' sea green and bind off. If cutting for armhole, work 4 rounds in reverse stockinette st before binding off (for sewing sleeve to body piece). Assembly: Sew shoulder seams. 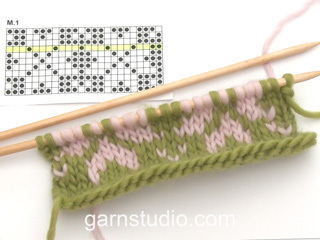 Pick up approx 90 sts around the neck on needle size 2.5 mm / US 1.5 with sea green and work 3 rounds rib, bind off. Set in sleeves. If cutting for armhole: Insert a marking thread in the middle of the inc sts for armhole. Sew 2 seams on a sewing machine around the marking thread, 1st seam = ½ st from the MT, 2nd seam = ½ st from the 1st seam. Cut for armholes. 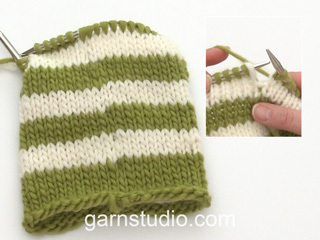 Set in sleeves as follows: sew the last row in stockinette st on sleeves to row after machine seam on armhole. 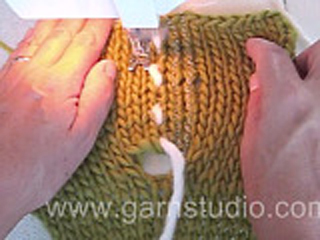 Turn sweater inside out and fasten piece in reverse stockinette st on sleeve to body piece.